Yes, this amazing goodness was on my counter. Yes, it was quickly consumed by my small group. Yes, it was AMAZING! 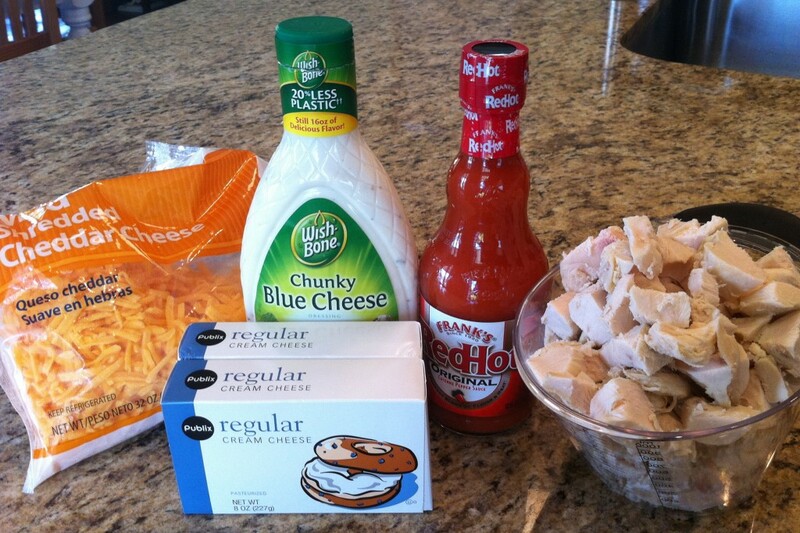 If you have never made Buffalo Chicken Dip, you are seriously missing out. Seriously! The beauty of Buffalo Chicken Dip is that you have all the yummy goodness that is wings without the bones. And, there are chips. You can dip chips into the yummy goodness making it awesome yummy goodness. You can dip celery as well, but the chips put it over the top. 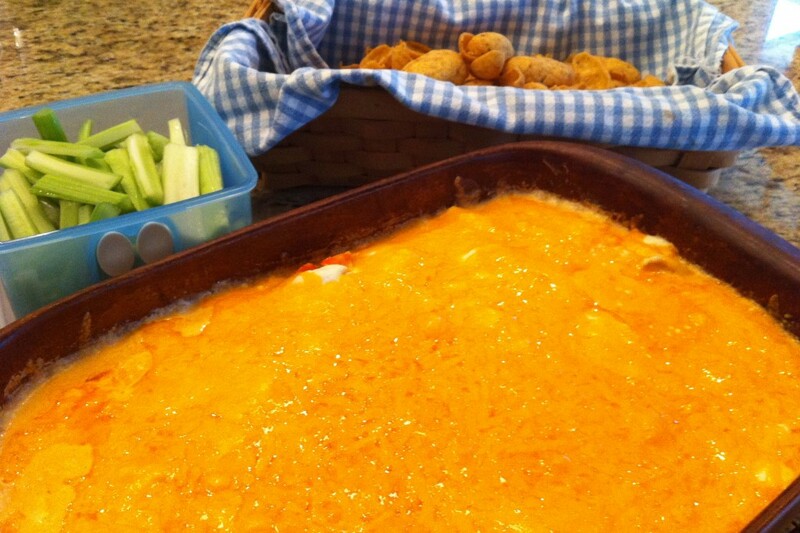 In my opinion, there are a few things that make simple Buffalo Chicken Dip even better. Use real chicken. I’ve seen recipes where you can use canned chicken. It’s not the same. It’s not as good. Use actual chicken that you have cooked and then diced or shredded. Shredded actually does better than diced as a discovered when I made it this time. Use more chicken and cheese than the recipe actually calls for. Okay, this may actually only apply at the House of Hills, but whatever meat is called for in a dip, I always increase it. Same with cheese more is better right? Use a good quality blue cheese dressing. Some people use ranch dressing. I prefer blue cheese dressing. And, I discovered that Wishbone is better than the Kraft I usually use. Gotta love just buying what’s on sale. You discover the greatest things. In a 13 by 9 inch pan, combine the shredded chicken meat with the hot sauce , spreading the to form an even layer. In a large saucepan over medium heat, combine the cream cheese and blue cheese dressing, stirring until smooth and hot. Pour the mixture evenly over the chicken. Bake uncovered for 20 minutes, then sprinkle the shredded cheese over the top and bake uncovered for another 10 minutes. Let stand 10 minutes before serving. Serve with scoop Fritos and celery sticks. Let me tell you. If you want to make a group of people (especially men) happy, serve this at your next gathering. People will worship the ground you walk on. They will praise your name. This entry was posted in Recipe by KHill. Bookmark the permalink. Yum! We make the fake version at our house with canned chicken, but I agree that yours is probably better! And yes to extra cheese!! I have never thought about dipping w/ fritos or celery sticks though – we just use tostitos … must try now! Oh Fritos are MUCH better than Tostitos in my opinion. Especially if you use the real chicken which is heavier and harder to dip. And celery – mmmmmmhmmm. I’ve made this a few times to rave reviews each time. I use Marie’s dressing. They have an extra blue cheesy version that is fantastic for it. So glad you shared this recipe a while ago!!! Oh I bet the Marie’s is VERY good. I think I’ve had that dressing but never used it for this recipe. Hmmm… will have to watch for a coupon. Thanks for the tip!